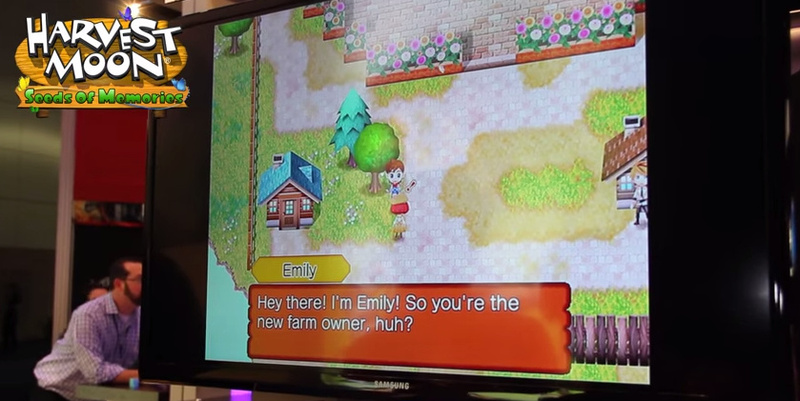 Natsume always has a diverse catalog of games to show at E3, but the cream of each year's crop is undoubtedly Harvest Moon, the premier farm-life simulation series that's been offering players quiet pastoral pleasures since 1996. This year, after having just produced their first in-house Harvest Moon with last year's The Lost Valley, Natsume announced a follow-up called Harvest Moon: Seeds of Memories, and we were able to stop by Natsume Acres to spend some time with a very early build of the newest title in the Harvest Moon stable. Walking up to the Seeds of Memories section of Natsume's farm-themed booth, we were in for two surprises right off the bat. First, instead of the 3D models we'd seen in The Lost Valley, Seeds of Memories was sporting an overhead, two-dimensional look that resembled the Super Nintendo original more than it did any modern Harvest Moon. Second, the showfloor demo was running not on a Wii U, but on an iPad. Even though the E3 build was running only on iOS - one of the game's four platforms, along with Android, PC, and Wii U - it still gave us a chance to check out how Seeds of Memories is shaping up in its early stages, and to talk to Nastume's Community Manager CeeCee about the state of the farm. Heading into the demo, the first thing we noticed was that several of the characters from The Lost Valley are back. We saw rhyming bard Gilbert, tough guy Brutus, and village sweetheart Emily, along with several other familiar faces - though since Seeds of Memories isn't a direct sequel, these returning characters will have slightly different personalities or new jobs within the game. Brutus, for instance, has switched professions from miner to carpenter, while Gilbert will happily teach you to fish, if you so wish. All of the bachelors and bachelorettes from The Lost Valley - including recently released DLC datables Luke and Andrea - are back as marriage candidates, along with at least one new belle and beau, for a total of five each. Even with the returning characters from The Lost Valley, however, what we saw of Seeds of Memories seemed to share just as much with classic Harvest Moons. Terraforming is gone, for one thing, and though Natsume hasn't revealed exactly how farming will work in Seeds of Memories yet, we were told it will be both "traditional and flat". 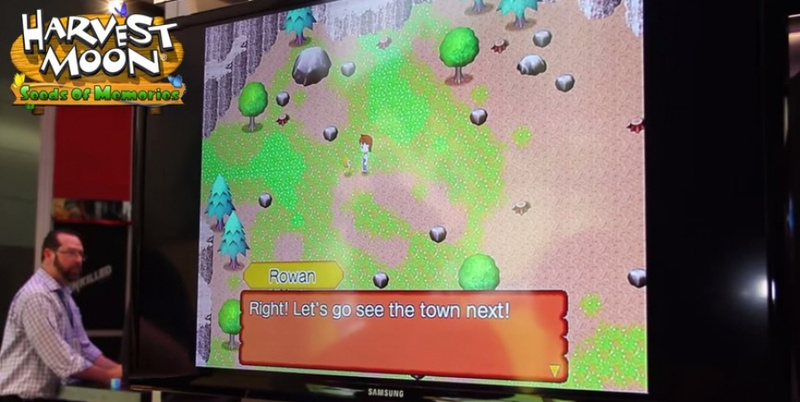 The overhead viewpoint isn't the only callback to the original SNES Harvest Moon, either; a three-way fork in the road connects your farm to the east, a mountain to the north, and town to the west, and Chestnut Town's layout - with homes and businesses arranged around a central square - will be instantly familiar to former 16-bit farmers as well. These obvious nods made us smile, but the older Harvest Moons' influence shone through in some subtler points, too - in fact, bringing back The Lost Valley's inhabitants was inspired by the recurring casts of older games. "With Back to Nature, Harvest Moon 64, and Friends and More Friends of Mineral Town, you have that consistent cast, and everyone really got to know them", CeeCee explained. "When we talk to people and ask 'What do you love about those classic games? ', it always comes up that they got to know a character over more than one game, and that's really the motivation for bringing that [Lost Valley] cast forward in Seeds of Memories". In terms of gameplay mechanics, details are still scarce, but we at least know that mining and foraging in the mountains are making a return, along with gifting to get your affection levels up. Sheep, chickens, cows, and your trusty dog are all confirmed as well - back in their Lost Valley style - along with a new animal addition: a wild bobcat which players will be able to befriend. There's also the titular Seeds of Memories, which will help restore the townspeople's memories as you collect them. While they weren't featured in the E3 build, they sound a bit like an agricultural achievement system; you'll earn Seeds for "everyday activities, like raising a cow, or planting 100 turnips" - though those are just examples, and might not be real Seeds in the game - with the idea being that Seeds will offer smaller milestones along the way as you work towards the main goal of the game. "We love the idea of an overarching goal, like restoring all the seasons in The Lost Valley", said CeeCee, "but we also like these mini-goals - we want activities that are longer, but some bite-sized ones as well". The controls on the iOS build we played were touch-to-move and tap-to-interact, which worked fine, though we fully expect that the Wii U version will employ traditional controls. Admittedly, it felt a bit odd to play Harvest Moon on an iPad, but any quirks of the mobile version shouldn't mean much for Wii U ranchers - we were told that there be parity between the Wii U and Steam versions, while the iOS and Android versions will offer a different experience. The demo we played of Seeds of Memories was very early on in development, but one thing we took away quite clearly from our time with the game is that the house of Harvest Moon has definitely been listening. They've taken plenty of feedback to heart, and after breaking the mould with The Lost Valley, seem set to combine that game's style and setting with a return to classic Harvest Moon roots. It's still a long way off from sprouting, but we're excited to learn more about Seeds of Memories as it buds and grows along the way. Hmm. Loved the SNES one. Maybe this will be one to get for Wii-U. A shame the art isn't actually 16-bit inspired but looks like a lot of cheap mobile game art assets. As in not the better 2D mobile game art out there. The art style is much more like that last DS Harvest Moon game than a SNES game. Forgot what it was called, but it was dual release on 3DS as well. It looks flat out horrible. Its this inevitable look when you try to reproduce 16 bit assets on modern engines with high resultions. It just looks cheap. And that level design reminds me of some really early RPG Maker maps. The thing is, Harvest Moon games were never all that beautiful, but they had a certain charme to them. For me, that is kinda lost in zoomed out and empty maps randomly littered with assets. Oh well, its down to gameplay alone to keep this boat afloat. I'm not really digging the look of the trees and rocks but the ground tiles and houses look great! This sounds great. Just add plenty of animals, plenty of crops, and more events. Hmm I might be checking this one out. I could go for a Harvest Moon to play on my big screen. Definite must buy for me. I love the look! I'll be honest, I really hope the Wii U version doesn't use the same graphical style. It can (and arguably should) look a lot better than that on a home console. Natsume should be looking to push themselves and set some solid standards. It doesn't have to be mind-blowing, just more than a cheap-looking 'retro throwback.' I believe they can do it and I hope they do. I suggest waiting for more development time and more diverse screenshots before declaring the art style "flat out horrible." It does seem to be a step backward though. I think the series as a whole would benefit from a new look altogether, like cell shading or some kind of theme like Yoshi's Wooly World's yarn or Okami's traditional Japanese painting look. From this screenshot I gather they're, unfortunately, going for a generic JRPG look once again. As for gameplay, I hope they don't discard some of the improvements they have made to control over the years in the name of doing a throwback. The context sensitive controls in Lost Valley were great and the terraforming was an excellent idea. Unfortunately the execution was sloppy and unrefined. I think it's a shame that they're abandoning it instead of improving upon it. I think the ideal Harvest Moon would have the personality and atmosphere of A Wonderful Life, the customization and breadth of content of A New Beginning, and the modern controls and mechanics of Lost Valley(albeit with better execution). It'll never happen but man can dream. Console-wise, I still think Animal Parade is the best one. I think the best approach to making a new Harvest Moon is play Back to Nature, then make something exactly like it. Then again I've been playing Friends of Mineral Town the past few days so I'm set on my BTN remake desires presently. @DrDingus Context controlls belong in P&C Adventure games and nowhere else in my opinion. For me, the "perfect" Harvest Moon experience would be a mix of Animal Parade, Sunshine Island and A New Beginning, with a slight hint of Rune Factory coated in a thick layer of Back to Nature. Animal Parade as a whole was a very pleasant experience. Its gameplay wasnt overloaded, but it had severe pacing issues. Sunshine Island had a very interesting water / sunlight mechanic. But it was hell if you didnt have photographic memory to exactly calculate water / sunlight levels for each and every plant. With proper icons floating above plants, this could turn into something rather deep. A New Beginning speaks for itself. The customization and crafting was a sight to beholf for HM fans. Such a great game that could have benefittet from faster pacing. Rune Factorys most motivating feature is its ridiculous character levels. In later games, you can level up pretty much everything, from sleeping to talking. Over the top ? Absolulety, but extremely motivating in the long run and in between things to do. Back to Nature was and probably will ever be one of the most "complete" HM experiences. A very solid game, content rich, well executed, perfectly paced. Just a really really good game, although a bit basic compared to more modern ones. And in regards to its graphics. Those screenshots are more then enough to say that honestly. There is literally no artistic value in them. Basic assets slapped together in a rather amateurish fashion. You can tell by teh way the tiles are placed. Just google "RPG Maker" and youll know what i mean. This cannot release as a full Wii U retail game. It refuse to believe this will be anything more than a $9.99 eShop release, honestly. Not only do you unsuccessfully emulate another company's idea, you fail to impress with graphics, characters and games. There's a difference between "going back to roots" and "making your game look like it was made in RPG maker". Thank GOD XSeed has taken localization duties for Story of Seasons, the REAL Harvest Moon. Throw your game into the pigs feeding trough. This is slop. This game's art looks incredibly bland. Thanks but no thanks. I'll stick to marvelous's Story of Seasons. I didn't agree with this comment at first, but seeing the Steve Brule icon and reading it in his voice changed my mind. These graphics look lame as hell. Glad I checked it out a little more closely. For your health. Hey you're not such a dang hunk after all. I just want a great farming sim game. Something more akin to A Wonderful Life, but bigger and better. Please. Ugh, it actually looks like a copyright-infringement evading ios game knock-off of a more popular/successful series. I can see what they were going for, something like Friends/More Friends of Mineral Town, but everything is too clean and static looking. I can't believe I'm saying this, but it feels like more care and effort was put into Lost Valley than this one. That looks absolutely horrible. I kInda lost some of my interest in this now. @ClassicJetterz Was going to write a comment, but this pretty much sums up my feelings on this one. Natsume's localizations have always been subpar, and their HM games are looking pretty wretched too. I am definitely getting this game. Every time Harvest Moon games increase in value once they become retro for some reason. If I had the money I'd get two copies. Word play writing for the win! This game looks fantastic. As a huge fan of the series, I can't wait! However the graphics look like they're from a mobile game. Those trees look like they're made of plastic. They gotta use the wii U's textures and other graphical capabilities more. Am gonna wait and see if they do something about that before committing to buy, ignore the comment I made 4 mins ago that I can't edit for some reason. As a long time Harvest Moon fan I'm loving the art style. Definitely keeping an eye on this. I'm all for Retro throwbacks but this honestly just looks like a cheap, facebook Harvest Moon knock off. Graphics aren't everything but come on, they could have done something far more grand for a game that's going to be on console and mobile considering what both platforms can handle nowadays. Not impressed with what I'm reading about the game itself either. I thought Natsume would take TLV's criticism to mean they should work harder to polish and perfect the direction they taking with the series... but going off that description, it seems they just gave up on one of major differences and settled on using a gimmick-y nostalgia fueled knock off of past BokuMono games? Even going as far as to use "inspirations" of past BokuMono characters... REALLY?! Have they have no sense of pride? Never played a Harvest Moon game, but was looking to grab one, should I wait for this one or maybe just get Story of Seasons (which i know wasn't an "official" HM title but made by the actual people who used to make Harvest Moon). I'd definitely recommend Story of Seasons, I'm having a blast with it. Has a charming aesthetic and the music's good. I haven't played a lot of the past HM games to compare it to but a lot of long time fans seem to consider it one of the best entries in years. Seeds of Memories seems to be aiming to replicate the past console HM game and drop nostalgic nods. Natsume's in house efforts like Hometown Story and The Lost Valley don't exactly have the best track record so I'd personally wait for the reviews on this one. There's also Rune Factory which is a spin off of the HM series (the real ones) but has more fantasy RPG elements. The 4th installment came out in 2013, I have it and what I've played so far is really good. The most beautiful game I've seen on the 3DS and it even has animated cutscenes. @scubydo story of seasons is a true successor to the harvest moon series, it is the next bokumono in Japan, the only difference is that x seed now localizes but Natsume owns the harvest moon name in the west so they're now trying to make their own out of desperation for losing their biggest franchise.